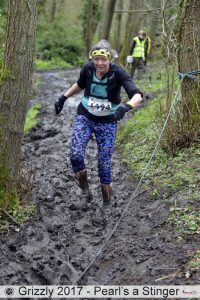 Lesley Pymm reports: My favourite race of all time and the 20th year that I had been there. I didn’t get in last year (it is so popular that there is a lottery now), and three years ago I had to drop to the Cub Run as I had a fractured jaw. This was to be my 19th Grizzly then. It was the 30th Anniversary run, hence the name of the event. The weekend started with Seaton parkrun. Those who have been doing Cannon Hill for a while may remember Carol and Lesley who were regulars there and who moved to Seaton. They have been very involved in setting up the parkrun there, so I was looking forward to doing it. 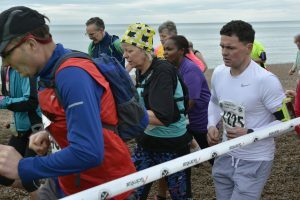 It goes along the prom, so I had expected that there would be lots of extra runners and it would be like a big conga as there would be no room to overtake. They had thought of this, and changed the course so that we got to run on the beach for some of the first lap. What joy – practice for the Grizzly the next day. The weather was good for the Grizzly – not as good as you had last year, Suz, but better than the year before when it was awful. The Grizzly is just such a wonderful event, in my opinion. It starts on the road with the town crier seeing us on our way, and then soon we are on the beach. For those who don’t know Seaton, it is a very stony beach! Around the yacht club, back on the road and then out towards Beer. There is not much they can do about this bit of the route as there have been landslips and so there are no options but to go on the road. In Beer there are always lots of people out and there is a lot of high 5-ing with the children before we go out and get on with the real Grizzly. We went out through the caravan site at Beer Head and then were climbing on Beer Common before dropping onto a very muddy path that took us towards Branscombe. It is at Branscombe that the Cub splits off from the main run. We run through the water here for the first time and then, passing the steel drum band. go along the footpath towards the village hall. I always think of this as a new path, but it has been there for some years now. Passing the village hall, there is a bit of road before we turn off and start to climb through the woods. It was here that I got the first whiff of wild garlic this year. The route twists and turns. There is lots of music out there and a real feeling of camaraderie as we are all in this together. 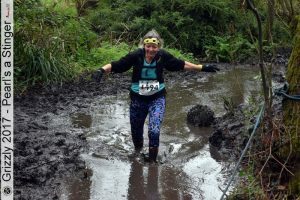 Eventually we were getting near to the first of the bogs, so I put my gloves on to try to keep my hands clean (learned that lesson at Belvoir! ), but it wasn’t too bad at all. It was very wet and I was knee deep in muddy water, but it was not too sticky. I don’t think the pile of spare shoes would have been needed this year! After the first bog there was a bit of road and then it was down to the second bog. Getting back out after that was hard. There was a big climb and ropes were needed as it was so slippery. Moving on I could eventually hear the music coming from the Fountains Head Pub where there is usually a beer festival and always a band playing. One year I’m not going to run, just go to the pub – it always looks such good fun. After the Fountains, I always think of it as the last bit of the run. I am on very familiar ground now and can almost smell the finish about 5 miles away. The route goes up through lots of wild garlic and primroses until eventually getting to a path running through the woods to take us back to Branscombe. 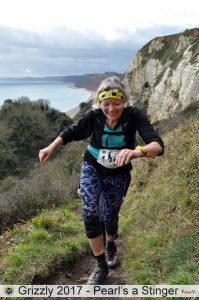 Over the past few years there have been some steps put in at Branscombe which I always find difficult with my knees. Anyway, having managed them, there is a steep slope back into Branscombe Mouth. Back onto the beach and a long run along it until starting to climb on the Stairway to Heaven. This year there was a preacher on the Stairway to Heaven. At the top, you run on the cliff for a while and around the bend, the finish can be not only seen but heard. It is still a few miles away though. Back through the caravan park, where someone was kindly sharing their 70th birthday cake with us, and onto the road into Beer. In Beer we are directed to climb up through some gardens before getting onto the path that will take us back almost to Seaton. There is a new footpath to be negotiated, then back onto the road and into Seaton. Brilliant run. Something like 20 miles with over 3,500′ of climbing. This entry was posted in 20 miles, Multi-terrain, Race Reports, Uncategorized by Race Reports. Bookmark the permalink. 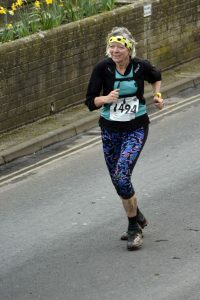 Well done Lesley ; wish i had entered the ballot again reading this.Its definatley a must do race.Bought it all back to me ; great race report too. I’m definitely going to enter the ballot for next year! Brilliant report. Lesley you’re a legend! This sounds seriously tough but you’re clearly having a ball. I now have an Elkie Brooks ear worm but loved reading your report!